Seafield Street in Cullen, near Buckie, Moray sleeps 6 people. Seafield Street near Buckie, can be found in the town of Cullen - Cullen is just one of the many jewels in the Moray Firth’s crown - a wonderful place for a great holiday experience! Spacious, with an airy feel, this self-contained and comfortable apartment has a secluded sitting-out area with hot tub for guests’ use. It makes a wonderful place to relax in after a day out exploring the area or taking in the sea air along the gorgeous coastline. The owner also provides guests with bathrobes, slippers and beach towels. The clear waters here are the base for a resident colony of bottlenose dolphins, and there are several companies in the vicinity running wildlife cruises, when you may also spot seals, many seabirds and even whales. Golf enthusiasts have a lovely links course practically on the doorstep, which has stunning views over the bay. Local dishes include Cullen skink, a hearty chowder-like fish soup; the nearby Cullen Bay Hotel holds the title of World Champion for this tasty dish! Moray is also known for its whisky, and there are many famous distilleries within an hour’s drive of the village. Cullen has a great variety of local amenities, good pubs and cafés, as well as a fabulous ice cream shop opposite the property. There is plenty to do here for all ages and abilities. The beach is 300 yards from Seafield Street near Buckie. With the shop 100 yards, the pub is 200 yards and the restaurant is 50 yards from Seafield Street near Buckie. Ground Floor: 5 steps to entrance. Seafield Street near Buckie is all on the ground floor. Bedroom 1: With king-size bed, Freeview TV and DVD player. Gas central heating, electricity, bed linen, towels and Wi-Fi included. Travel cot and highchair available on request. Welcome pack. Sitting-out area. Patio (shared with other apartments). 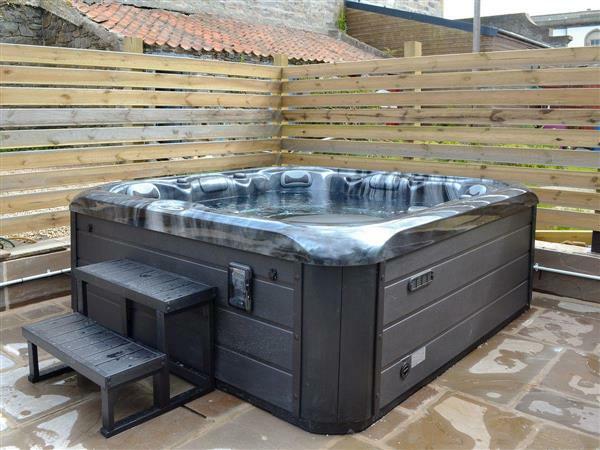 Hot tub for 6 (private, available 7am to 10pm). Bike store. Public car park adjacent; additional on road parking. No smoking. Holidays at Seafield Street run from Saturday to Saturday. For a better idea of where Seafield Street is, you can see Seafield Street on the map below. Seafield Street is in Banffshire; should you be on the lookout for a special offer, you can find all the special offers in Banffshire. It's always worth checking to see what is on offer at the moment. Do you want to holiday near Seafield Street (UK5419), you can see other cottages within 25 miles of Seafield Street; have a look to find your perfect holiday location.